The trailing edge of back-to-back storm systems parked over part of Riverside County early Thursday and caused flash flooding that sent mud onto roads, trapping people in vehicles, before moving out of Southern California. Flooding was reported in Hemet and other parts of Riverside County, where 14 people were rescued after a flash flood washed out a road in the community of Gilman Springs. Seven residences on the 20500 block of Gilman Springs Road were evacuated by Riverside County firefighters as a precaution. A flash flood warning in effect for western Riverside County expired at about 8:30 a.m. Radar showed heavy rain east of Hemet at 6 a.m., part of what the National Weather Service called a "nearly stationary" storm. Resident Muriel Dufresne said she was sleeping until the startling sound of thunder overnight. "It was outrageous, I couldn't figure out what is happening," Dufresne said. The area received about 2 1/2 inches of in just a few hours. Eric McGinley was one of about 40 people who were rescued after their vehicles became trapped in mud. "My windshield wipers just couldn't move fast enough," said McGinley. "It just looked like the road was going on and had a little bit of dirt on top, until I got out in the middle of it." 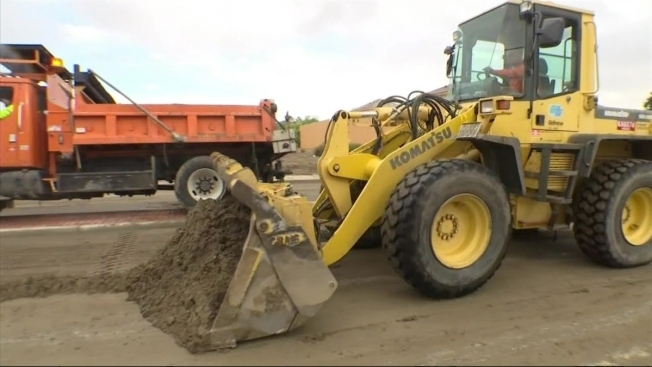 The mud was waste-deep in some areas, McGinley said. Aerial video showed at least two vehicles, including a sport utility vehicle, surrounded by mud on Gilman Springs Road in Gilman Hot Springs, about 30 miles southeast of Riverside. In nearby Hemet, at least three drivers' vehicles stalled as they attempted to cross a flooded intersection in the 1000 block of Sanderson Avenue. Flooding was reported in the Rancho Viejo Middle School parking lot, according to the Hemet Unified School District. Temperatures are expected to climb and skies will clear for most of the region, but some inland areas continued to face the threat of flooding. Runoff from the overnight rain was expected to continue for several hours Thursday morning. 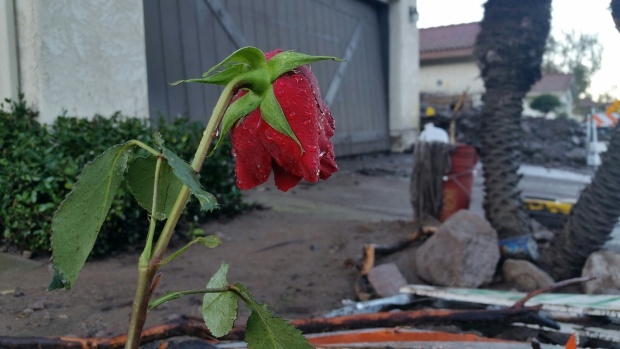 The hazardous conditions follow two consecutive days of heavy rain that included steady downpours and forced evacuations in Los Angeles and Orange county neighborhoods below wildfire burn areas. The National Weather Service canceled a flash flood watch for Los Angeles County early Thursday. Scattered showers are possible in the high desert, mountain and inland areas Thursday. Dry conditions are expected Friday before another round of wet weather this weekend.